The state has named the winning bidder for the next phase of work rebuilding Highway 520 on the west side of Lake Washington. The project, from early 2019 to 2023, will construct three eastbound lanes, plus a landscaped Montlake lid over the highway. Nowadays, the scramble for big contractors is so intense that Washington state will pay $30 million more than expected to rebuild the next mile of Highway 520. The state has announced it will accept a low bid of $455 million for the next phase of work rebuilding Highway 520 on the west side of Lake Washington. The project will construct three eastbound lanes, a landscaped Montlake lid over the highway, new intersections, a bus station and bike trails. The new highway section includes road decks on fixed columns over Lake Washington, west of the floating bridge that was completed in 2016. The winning bidder, Graham Contracting, offered a lower price than rivals Atkinson/Traylor and Kiewit-Manson — which all exceeded the engineer’s estimate of $375 million to $425 million by the Washington State Department of Transportation. Under the design-build contracting system, Graham’s team and not the state will do the final engineering. Construction is planned from early 2019 to sometime in 2023. Graham offered to finish the work several months earlier than the Washington State Department of Transportation (WSDOT) expected, but its ability to do so is still being examined, said WSDOT spokesman Steve Peer. “We want to thank all three teams that submitted innovative proposals. We know that costs have continued to escalate in this booming Puget Sound economy,” said a statement by Omar Jepperson, WSDOT deputy administrator for Highway 520. The new segment adds a wide bike bridge between the Montlake and Arboretum areas, and an eastbound bus-carpool lane. Rising prices aren’t just a problem for the Highway 520 project. Nationally, the cost of construction materials and fuel increased 7.4 percent in the past year, while 80 percent of surveyed companies reported a shortage of skilled crafts workers, the Associated General Contractors said Wednesday. In July, Sound Transit blamed runaway land prices and construction inflation for a 22-percent spike — a total of $460 million — in its mostly-elevated light-rail extension from Angle Lake to Federal Way. 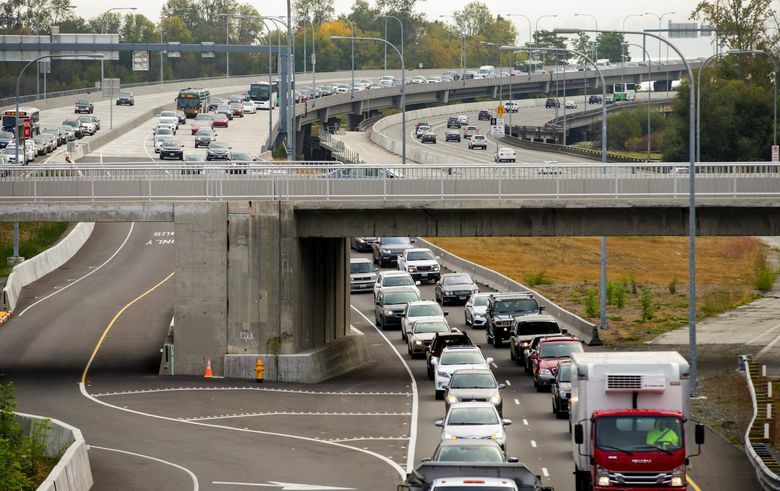 In a separate contract, WSDOT plans to add a fifth, bus-only express lane on I-5, connected by a new overpass to Highway 520 by 2023. That will allow new routes on which Eastside-to-South Lake Union riders can travel directly to the I-5 Mercer Street exit at morning peaks and return in the afternoon. The latest Highway 520 phase is part of the overall $4.6 billion corridor rebuild from Bellevue across Lake Washington to I-5 from 2010 to 2029. “It’s still within our budget,” Peer said. State budgets show that just over $1 billion will be left in the 520 fund for future work, including a new Portage Bay bridge.